French Open 2014 made a very strong impression. The level was high, and the tournament could bring many countries to the Tatami. French Open 2015 is held 13th of June, and it could mean the last test before the World Tournament for some one! Read more – guide lines and info – and some og the fights from last years tournament! 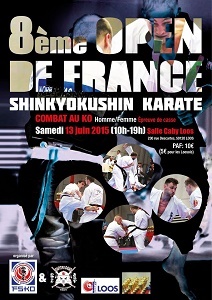 Click the picture↓ from last years tournament (←link to results) for pdf info, and do not forget to visit the official Facebook page – French Open Shinkyokushinkai. And scroll down for videos!